Going through Diatonic Liaisons it seemed to me there must be quite the story behind its compilation. So I e-mailed a few questions to Alexandra Browne which she graciously answered. If you’re interested in getting a copy of Diatonique Liaisons, e-mail Alexandra at alexandra.browne6@btinternet.com. How did you get involved with the accordion? I loved the sound of the melodeon and its inherent bounce right from the start but simply couldn’t reproduce that with my big, heavy 72-bass piano accordion, so I borrowed a little Hohner Pokerwork from the great Dave Parry, who was playing for Rogue Morris in Oxford at the time, and I was playing a tune within the hour. It just felt so natural and I was in love. So I bought the box from Dave and sold my bulky accordion, never to turn back. And how did you encounter French music, and come into contact with this extraordinary group of musicians? I never clicked with the English style of playing, it so often being very chordal on the right hand and with lots of improvisation, both of which don’t suit me. I have always found that frustrating as I love the style. I got into Continental music and dance through Blowzabella and the wonderful Andy Cutting. I can’t explain why I took to the music so well. Maybe it’s because there aren’t usually that many chords on the right hand! I came across other professional musicians at workshops in England and France. Meeting the greats was an amazing experience for me as in the everyday world celebrities are inaccessible. Here they were, right in front of me, the musicians whose skill and style I aspired to, and I could speak to them and ask advice! It was an exciting and instructive time. And how did you decide to do the book? 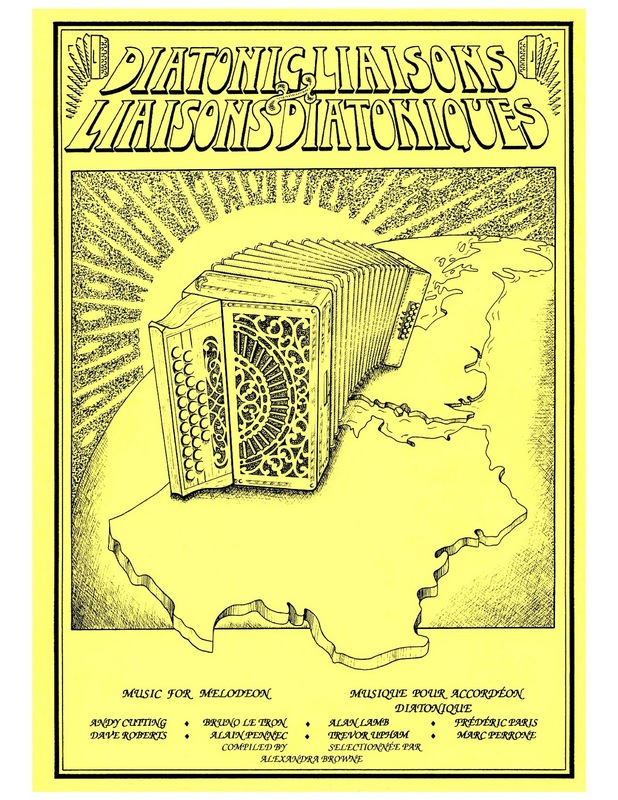 How Diatonic Liaisons came to be: In the early 90s I used to help a friend with his playing and used Continental tablature to teach him tunes. My friend suggested I should do a music book but I balked at the idea as I was unsure of my abilities. My friend, without my permission, rang Dragonfly Music and got Matt Seattle interested! By then I really couldn’t say no. I must admit I was intrigued by then. I only had the 2-row Pokerwork so wasn’t really up to the job of transcribing tunes by musicians who often had 2 1/2 or 3-row boxes. Fortunately, Andy Cutting put an order through for me for a Castagnari Mory and, after playing for a few months, found I could understand a bit more about what other players were doing and did my best to reproduce it. Andy was a player I admired to such a degree that I had occasional lessons with him. I picked and picked that poor man’s brains, but he was always very patient and helpful. I dedicated my tune ‘The Cutting Edge’ to this finest of musicians. I hadn’t studied written music since passing grade eight at 18 years old and now I was in my early 30s, so was very rusty. My twin sister, Pippa Holister, was a music teacher so she helped me a lot in those early days. Eventually I was working more and more on my own. Once I became more confident, I contacted the French players to ask permission to use their work and also to beg for demo tapes and written notation. I was really nervous as I was still unsure of myself and my French was dodgy too so I had French friends help me with writing the letters. I had no idea how the musicians would react and if the book would ever get off the ground, but they were wonderful and extremely helpful. They always found time for me even with their hectic schedule. I remember phoning Marc Perrone at a workshop; I was very nervous. A lady answered and wandered off to get him. I waited and waited and heard in the distance slow, calm footsteps echoing down what sounded like a passageway. It seemed to take forever and I was getting breathless with nerves. The footsteps got louder and louder and I expected a rather harassed voice to answer. But no, it was, “Ah bonjour Alexandra! Ça va? !” He immediately put me at my ease. What a wonderful man. I gradually amassed enough demo tapes and notation and also worked off commercial records and tapes (no CDs then!). It was extremely hard to pick out the melodeon from the other instruments but my ear improved over time. What was it like doing the work of producing the book? To be honest I hated the work but the idea of producing this book excited me, so after a few years the book was near completion after a number of changes in direction and ideas. Then I went and had a baby didn’t I? It was the worst timing. I struggled to finish the last little details with a baby crying and generally making the demands babies do and I was exhausted, but determined. At last the book was done and a major part of my life over several years had come to a satisfying end. I was so excited. Only one print run was done and the books were then passed to another publisher after a few months. Only a few books were sold as they were originally very expensive, at £25, but then they were lost at a French festival when the van they were in got stolen. The publisher didn’t want to pay for another print run and I would never have been able to afford to pay for one myself. That was the end. It was excruciating as I’d spent so much time and effort on the book. Then came the digital age. So, nearly 13 years after the last book was sold, I took up the challenge and wow, what a success, at long, long last! I could not have done this without melodeon.net. What a brilliant and friendly forum that is. I thank you all for the success you’ve made this book. Awesome, Gary, and thanks to the interviewee as well, for sharing her stories! The book is not currently available in hard copy but is as a PDF. Please email me on the email address given in the article. Many thanks, Alexandra.